SkyTeam’s goal of recruiting Gol as a new member took one gigantic step forward this week with Delta Air Line’s acquisition of a minority stake in the Brazilian carrier. The deal also further separates Delta from its US peers as the airline continues to aggressively pursue a strategy of investing in carriers from Latin America and potentially other overseas markets. Other US major carriers have not yet duplicated this strategy but should be enticed to follow Delta’s lead given the opportunities which exist outside the mature US market. Delta’s eagerness to invest outside North America first surfaced in late 2009, when it made an ultimately unsuccessful bid to acquire a stake in Japan Airlines while the oneworld carrier was restructuring under bankruptcy protection. Nearly two years later, in Aug-2011, Delta made a lower profile but equally significant move in agreeing to acquire a minority stake in fellow SkyTeam member Aeromexico. The USD65 million deal with Aeromexico will give Delta about a 4% share in its Mexican partner as well as a seat on Aeromexico’s board. Delta on 07-Dec-2011 forged an enhanced partnership agreement with Gol which includes a USD100 million investment, resulting in a share of approximately 3% and a seat on Gol’s board. Gol is currently an unaligned carrier which over the last couple of years has forged partnerships with several carriers from both oneworld and SkyTeam. Gol’s management team has repeatedly stated its intention to stay non-aligned and Gol CEO Constantino de Oliveira Junior, in speaking to analysts this week after the deal with Delta was concluded, said the carrier will continue to pursue tie-ups with carriers from all alliances as well as non-aligned carriers. But SkyTeam, led by Delta, has been actively trying to persuade Gol to join the alliance. These efforts will continue with Delta, now that it will have a seat on Gol’s board, expected to eventually have its way. As CAPA reported last month, Gol could be persuaded to adjust its independent alliance strategy as other Brazilian carriers make global alliance commitments. Currently only one Brazilian carrier, TAM, is in a global alliance – Star. But TAM is expected to opt out of Star and join future sister carrier LAN in oneworld as part of the upcoming alliance selection of the new LAN-TAM parent company LATAM. Star, meanwhile, is keen to add Avianca Brazil as a new member in the likely event it loses TAM. Avianca Brazil could be accepted as a new Star member as early as 2012. 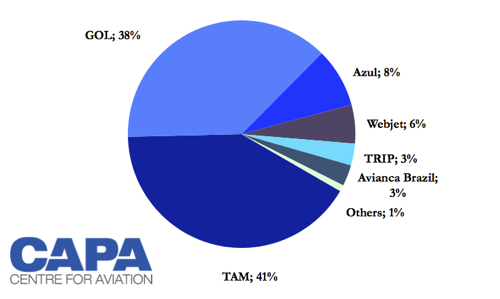 Avianca Brazil’s sister carriers in Colombia, Peru and Central America were already accepted as new Star members last year and will formally join the alliance in 2Q2012. There would be little value for Gol to stay independent if Avianca Brazil ends up in Star and TAM switches over to oneworld. Gol now benefits from its non-aligned status because it can work with members of oneworld and SkyTeam as well as other non-aligned carriers such as Qatar Airways. Gol essentially is the default partner for any foreign carrier serving Brazil that is outside Star. Non-Star carriers, which are unable to work with TAM, are keen to tap into Gol’s extensive domestic network. Meanwhile, Gol, as a low-cost carrier with a hybridising model, is keen for the high-yield domestic traffic which comes from long-haul carriers. But if TAM joins oneworld, Gol will likely have to shut off its codeshares with American Airlines and Iberia. Delta may also insist that Gol end its partnership with American. In the event Avianca Brazil joins Star, Gol would also be unable to forge ties with the several Star carriers which now serve Brazil and codeshare with TAM. Delta clearly sees a favorable scenario. By forging a closer relationship with Gol and acquiring a stake in the carrier, Delta is now in the driver seat as Gol reviews its alliance strategy. Air France-KLM and Aeromexico, which Gol also already codeshares with, will also push hard for Gol to join SkyTeam. Investing in Gol is a shrewd move for Delta for not only advancing the SkyTeam cause. Gol is a large carrier in one of the world’s biggest growth markets. As Delta CEO Richard Anderson pointed out, Gol’s stock is “significantly undervalued”. Gol’s stock took a tumbling earlier this year as the carrier slipped back into the red in the second and third quarters, driven by a significant decline in domestic yields and irrational fare wars. But market conditions have improved in recent months and Gol is now in a position to return to profitability in the current quarter and 2012. As a result, Gol’s stock price has recovered slightly since reaching a low in early Oct-2011. This week’s deal with Delta led to a further spike. The Brazilian domestic market, which has grown by almost 50% since mid-2009 and is now the fourth largest market in the world, would be attractive to any carrier from a mature market. Brazil’s rapidly growing middle class is raising income levels, allowing a larger sector of the population to fly domestically (last year for the first time there were more domestic airline passengers in Brazil than intra-state bus passengers) and in future internationally. With the US the most popular overseas destination for Brazilians, Delta is now well positioned to meet the needs of Brazil’s growing middle class, a larger portion of which reside in fast-growing secondary cities which US carriers can only access through connections with a domestic Brazilian carrier. The Brazilian market is competitive but consolidation has resulted in a realistic equilibrium of four major carriers – two legacy operators (TAM and Avianca Brazil) and two LCCs (Gol and Azul) – along with several regional carriers. All four of these major carriers should be able to achieve sustained profitability even as growth in Brazil slows slightly to the high single or low double digits. Gol is particularly an attractive investment because it has a 38% share of Brazil’s domestic market, putting it just behind market leader TAM. Its pending acquisition of Webjet, another low-cost carrier with a 5% share of the market, will give Gol a 43% share of the market and put it ahead of TAM. Delta is interested in further cementing its position in Latin America by taking equity stakes in local carriers. Aeromexico, which was already in SkyTeam and had a comprehensive relationship with Delta including on MRO services, was a logical first step. The alliance battle over JAL, which otherwise has no similarities to the LATAM situation (LAN and TAM are highly profitable while JAL was restructuring following bankruptcy), showed Delta’s willingness to be an active participant in global consolidation. Delta has since acquired a minority stake in Aeromexico. An equity tie-up with Gol, which like Aeromexico has a strong relationship with Delta that includes an MRO partnership, could be Delta’s next move in the region. It is logical for US carriers to look southward as they shed their insular roots and ponder investments in foreign carriers. As Airline Leader pointed out, US carriers are well positioned to invest in Latin America because they already account for a majority of international capacity in the region. US carriers now account for about 80% capacity from the US to Mexico, 78% of capacity to Argentina, 73% to Venezuela and 68% to Brazil. US investment in Latin American carriers also makes sense because of the historic economic ties between the two regions and their geographical proximity. In the 1980s and 1990s, ownership ties between US and Latin American carriers were common. But Delta’s investments in Aeromexico and Gol marks the first time a major US carrier has invested in Latin America since 2008, when Continental sold its stake in Panama’s Copa. American and United should take note. US carriers have largely missed out on benefiting from the world’s biggest growth market, Asia. This could be their last chance to diversify and directly play in a market which undeniably has more growth opportunities than the mature North American market. Delta has rapidly expanded its Latin American network in recent years, partially at the expense of US-Latin America market leader American Airlines. Now is a good time to make further inroads into Latin America as American may cut capacity in the region as part of its restructuring under bankruptcy protection. Delta president Ed Bastian told the ALTA Airline Leader Forum in Brazil last month that Latin America now accounts for 6% of Delta’s capacity, up from 4% in 2005, and the carrier expects to continue growing in the region at a double-digit clip. Over the last six years Delta has expanded its Latin American operation by 43%. Over the same period, other US carriers only expanded their Latin America capacity by 16%. Delta now has over 1000 weekly flights to 54 destinations in Latin America and the Caribbean. Delta continues to seek new partners in the region. Earlier this year Delta forged a codeshare agreement with Aerolineas Argentinas, which will be implemented in 2012 – ahead of Aerolineas joining SkyTeam in 3Q2012. By no coincidence Aerolineas in Sep-2011 forged a codeshare deal with Gol. If SkyTeam adds both Gol and Aerolineas, the alliance will increase its market share in Latin America from only 8% currently to a respectable 27%. As CAPA reported earlier this month, Aerolineas was expecting to be Gol’s first two-way codeshare partner. But Delta may now beat Aerolineas to the punch. As part of their enhanced partnership announced this week, Gol and Delta say their existing one-way codeshare will be extended to include Delta-operated flights between the US and Brazil. Additional Gol-operated domestic flights as well as Gol-operated regional international flights are also planned. Gol until now has only pursued one-way codeshare agreements with all its partners because it lacks the technology to sell tickets on other carriers. But Gol have been working with Navitaire on upgrading its reservation system to allow it to put its code on other carriers. This upgrade, as previously reported by CAPA, is slated for completion in early 2012. In addition to the two-way codeshare, Gol and Delta will start pursuing coordinated sales activities and co-located airport facilities. In speaking to analysts, Mr Oliveira said the two partners also hope to achieve “meaningful” cost and revenue synergies. He added the deal was part of the company’s continued strategy to deleverage Gol without diluting shareholder value and its strategy to preserve its low-cost model while generating additional revenues. “Delta’s vast experience in the US, the industry’s most developed market, combined with Brazilian commercial aviation's growth potential, provides an opportunity to improve our business model and return on capital employed over the next years,” Mr Oliveira said. Delta also has agreed to sublease Gol’s two remaining B767s, which will be transferred to Delta at the beginning of 2012. Gol has been trying to sublease or return its B767s since 2008, when it ended the long-haul schedule operation inherited from its purchase of Varig. The B767s have been a substantial drain on Gol’s financials as the carrier had to continue paying the monthly leases on the aircraft it was unable to return early. For a period Gol wet leased out some of its B767s and operated long-haul charters, using the aircraft in the initial 14 aircraft fleet that it was unable to return. But Gol has always has been eager to remove B767s from its fleet entirely and return to its low-cost roots with a single aircraft type. The Delta deal finally allows Gol to return to a simplified all-B737NG fleet (although it will take Gol about 18 months to replace B737-300s with B737-800s at its newly acquired Webjet subsidiary). But for Delta the deal is probably more significant and strategic. In one swoop, Delta’s Latin American strategy and its goal of wooing Gol into SkyTeam took a huge step forward.